Just like last year, the crocuses came up but didn't bloom. But the cherry tree buzzed with bees today, and I found myself welcoming the beginning murmurings of Spring amidst the missing that comes each year on my grandmother's birthday. I wrote this piece last year and am sharing it here for the first time. I wait all year for the day when the crocuses in my front yard seem to almost dance with their purple blooms reaching toward the sky. I wait all year for this day that always falls just near her birthday. This day that pushes me to know that Spring is returning, as she always does, even when I doubt. This day that feels like the beginning of a conversation between us. Me, here, living this crazy beautiful life. Her, gone for eight years now, whispering to the budding trees and the pushing upward tulips, encouraging them to grow. Almost every year during my childhood, I visited my grandparents during the spring. Some years it would be mid-March and the forsythia would be blooming. Other years it would be April and the azaleas and rhododendrons would appear like pink and purple dresses all around their town. My grandmother loved spring. She would name everything that was blooming when we walked around her yard, drove around town, visited the small lake near their house. When she died on a day in April, it was during one of the most gorgeous springs her town had ever seen. Everything was in bloom. Everywhere. Trees. Bushes. Flowers shooting straight up from the ground. Pinks. Purples. Fuchsias. Yellows. Oranges. Reds. And she never saw any of it from her small hospital room. I remember feeling like I was in a fog, as though the world around me was almost in black and white. We were driving back to my grandparents’ home after the funeral and I suddenly noticed all those blooms. My heart felt broken knowing she would never see them again, knowing I would never hear her voice. That next March, just before her birthday, when I was deeply doubting Spring could ever return outside or inside me, I was walking to get the mail and noticed the purple blooms of the crocuses in my front yard. As I stood there looking at the stripes and the unexpected burst of orange in the middle, a new kind of conversation began between us. Me, here, missing her so much I couldn’t breathe sometimes. Her, everywhere, breathing life into spring, into me. But this year they didn’t bloom. Nothing. Just green shoots and not one bud. I tried to ignore it each day when I would look outside the kitchen window, cup of tea in hand. But when her birthday came and went last week without one bloom, I couldn’t deny that my crocuses weren’t blooming this year. Even though of course the rational side of me knows that we won’t live in this house forever, that crocus buds do not really send a signal to my grandmother to visit me, part of me wondered if perhaps the conversation was coming to an end. 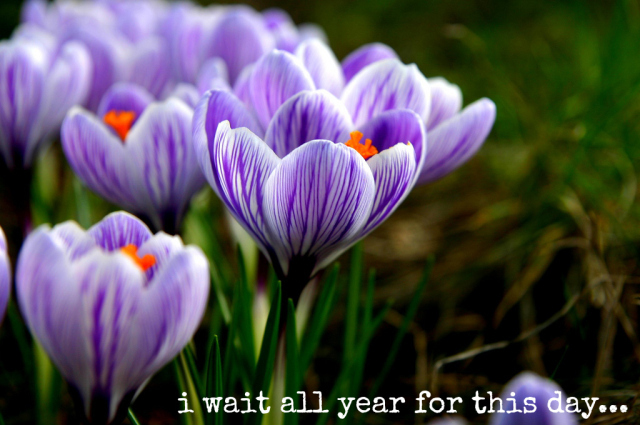 If it was time to move on from this belief that she pauses in my front yard to remind the crocuses to bloom each year.